WARNING: The Cabinets of Doctor Arcana contains occult images that may not be suitable for younger players.Can you survive this dark adventure set inside the sinister Arcana Manor? On a dark and stormy Halloween night, you find yourself standing before the manor's gothic gates. A strange force compels you to find a way in, but as soon as you set foot inside the mansion, the door slams shut behind you, sealing you inside the eerie manor house. A ghostly vision appears before you, presenting you with a challenge: Resolve a maze of riddles and perplexing puzzles, or be doomed to spend eternity locked inside the inescapable mansion. 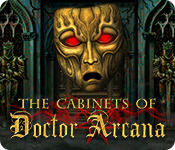 Do you dare accept the deadly challenge and discover the secrets that lie within The Cabinets of Doctor Arcana?The Cabinets of Doctor Arcana is a throwback to early computer puzzle games. 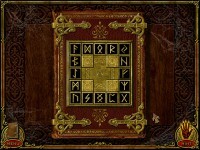 The game was designed to have a very retro look and feel within a simple framework with minimal mouse controls. 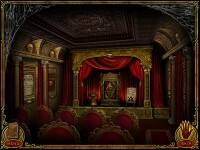 The end result is an effectively moody and entertaining game that evokes a haunting sense of nostalgia. Players must resolve a variety of devious puzzles to unlock Doctor Arcana's darkest secrets. 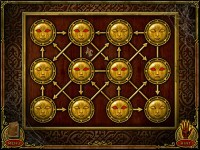 Players are also subjected to taunting remarks from Doctor Arcana throughout their adventure, and lost souls who consult the in-game walkthrough, aptly named The Cheater's Compendium, will be scolded and ridiculed for doing so. For those seeking something more mentally stimulating than the usual arcade game or hidden object adventure, this is the game for you. Discover the sinister secrets of Doctor Arcana to escape! Tell someone about The Cabinets of Doctor Arcana Mac Game! There is no any comments for this game yet. You can be the first! Write your comment!